The built-in camera is lousy and the digital camera doesn't have GPS nor Internet connection. By mixing the two in one system, you can use Open CV to edit the camera view, do some advanced image processing, face recognition, instantly share your pictures using social networks like Facebook and blogs...etc. If your grandma is uncomfortable with those complicated buttons and configurations on the camera itself, why not download an application called "Canon DSLR for Dummies". Your grandma will just take a tablet or a phone along with the camera, touch 3 huge buttons to take pictures and videos. And cool, she will be using the most complicated camera in her daily life! You can also make the user interface super scientific in the Android application, to fine-tune, save, share, download and upload different configurations for your camera. 3. It turns your camera into dual-screen camera. The best thing about having the dual screen on your digital camera is that you can take really good self portrait pictures and so no-one has to be missing from the pictures any more. You can position the camera and see as you stand how the picture will look and so this makes taking these types of pictures much easier. The dual screen also offers other advantages though and can be used to display a range of information. One of the coolest features is the way they can display a nice smiling image just before the camera takes the photo and so the subjects can tell when to smile and know when to smile for the photo. This is brilliant if you are taking photos of children as they can display something that they will like such as a clown and so they know to smile when they see this image. Your phone is perfect for working with those IP surveillance cameras. You can easily get live video streaming anywhere, and change the camera angle by touching your phone screen. How to control using an Android device? 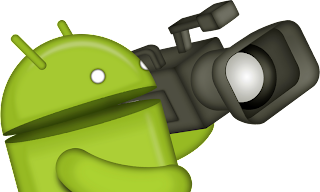 I am sure there are more cool solutions to connect Android to your camera. DIYers and manufacturers, let us know what your choice is!